Well, not quite. But with berries as juicy, sweet, and plump as these, no one has to know. 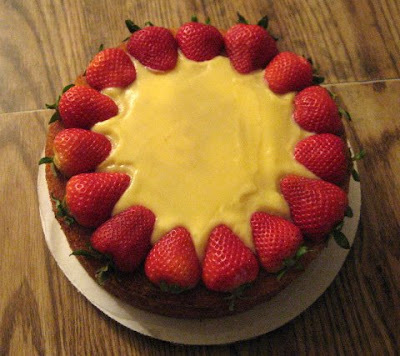 What a way to let our minds and taste buds travel out of chilly February and into a sunshine- and strawberry-filled summer brimming with pies, tarts, ice cream sundaes, and daiquiris. My assistant couldn't resist picking up a couple of pints of these ruby gems before whipping up two cakes--on the house--for two special birthdays. 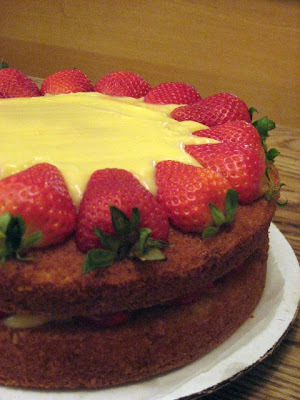 A moist butter cake layer generously slathered with french vanilla custard and fresh strawberry slices topped with a second layer of buttery yellow cake, more custard, and plump strawberry halves. 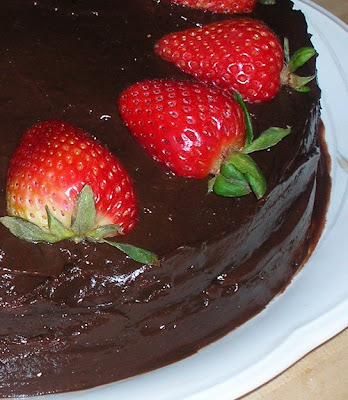 Here we have two layers of dark chocolate cake infused with Jack Daniels and Grand Marnier, a filling of strawberry slices soaked overnight in Grand Marnier, and lots of rich chocolate pudding frosting topped with fresh strawberry slices for one perfectly moist and tasty cake.